For Business owners in Bridport, Weymouth, Dorchester, Portland and the surrounding arears, the need to accurate maintain books for their accounts can be off-putting. While book are required to be kept up tp date for tax purposes (financial records must be kept for six years), bookkeeping also will be benefical to your business. Keeping on top of your financial situation and monitor the cash flow of the business. These records can be keep on paper or spreadsheet, or you may want to use a bookkeeping program, Allum Book-keeping Services in Bridport can help and demonstrate the best bookkeeping program to use in your business. 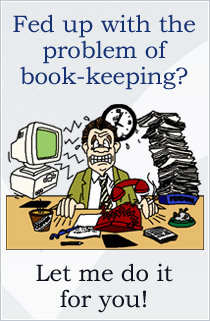 The problem of doing your own bookkeeping is to keep on top of the continuous, ongoing basis. For business owners this can mean having to spend hours 'doing the book' in the eaving or at weekends. Although outsourcing your bookkeeping may cost more than doing it in-house you will have more time to run your business. Also you will know your books will be compliant with the law and will be fewer errors. Allum Book-keeping Services provide Bookkeeping Services in Bridport, Portland, Weymouth, Dorchester and the surrounding arears in Dorset. For more information about my Bookkeeping Services in Bridport, Portland, Weymouth, Dorchester and the surrounding arears in Dorset. Please do not hesitate to contact me today.